Cumbrian driver Paul Bird continued his dominance of Blackpool based rally, The North West Stages at the weekend by securing his 3rd successive victory on the event. While Bird was on cloud 9 things ended badly for John Stone as he retired from 2nd place with a fire on the event that his company ‘Legend Fires’ sponsors. 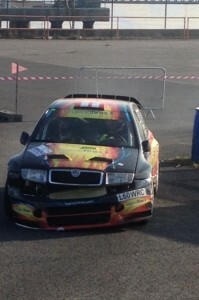 The event started at the Norbreck Hotel on Friday night with 5 stages following. The roads were dry but it was very cold and the forecast was for temperatures to be below freezing early in the night. With the forecast in mind Bird chose to go out on Pirelli ice tyres. The forecast was wrong and therefore Birds tyre choice was also wrong and he dropped 8 seconds to Simon Bowen on the first 2 stages. Stones event began well and consistently with two 4th fastest times. A change of tyres by the Dom Buckley Motorsport team for Birds Fuchs Silkolene backed Ford Focus WRC saw him move into the lead on the next and final loop of stages with a couple of stage wins and he ended the night with a lead of just 2 seconds over Bowen. Stone climbed one place in the second loop of stages and finished the night 3rd 25 seconds back from Bird. British Superbike team owner Bird stepped it up a gear on Saturday morning with 4 stage victories on the first 4 stages extending his lead by 36 seconds so his lead was now 38 seconds from Bowen in his Subaru. Stone driving the Legend Fires backed Skoda WRC with Carl Williamson on the notes was never out of the top 4 stage times on the first 4 stages and they held their 3rd overall. Stage 10 had a few incidents in it, first of all Paul Bird took a stage maximum after wrong slotting on the stage so he dropped over a minute in there. 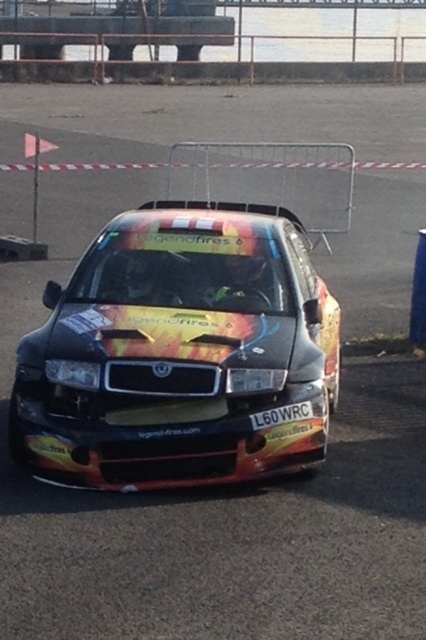 Next on the stage was Simon Bowen then John Stone and somewhere on the stage the pair collided, ending Bowen’s rally. Stone managged to drag his car to the finish of the stage where the Dom Buckley team set about repairing the body damage and also a track control arm that had been broken during the incident. All this drama saw Stone only drop 20 seconds but keep second place and was now breathing down the neck of Paul Bird as he was only 8 seconds clear at the front of the field. Stone had his tail up now and took 2 from Bird in the next stage but his tyres were gone. He slid wide and hit a kerb with the back of the Skoda on the next one and just drove round the next couple to get to service and get his WRC some new rubber. Bird on the other hand had stepped up a gear and went into service with a lead of half a minute. 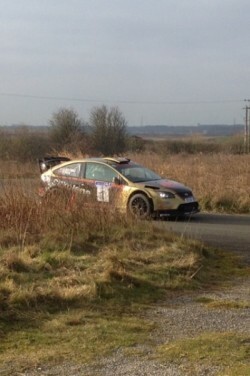 John Stone drags his car to the end of stage 10 after his incident. Two blasts down the promenade were completed without incident and Stone set his first fastest time of the day on Stage 16 taking 9 seconds from leader Bird. Not good news for Stone though. As he and Williamson came out the last corner the Skoda Fabia WRC gave a big cloud of smoke from under the car and then flames were seen. By the time they had reached the finish control the car was fully on fire. Luckily the marshals at the end of the stage reacted very quickly and got the fire out before the whole car was alight. End of the rally for Stone though who was just beginning to take the fight to Bird. Bird now had a lead of over 1 minute from his nearest rival but that did not mean he was going to back off. On the final 10 stages, Bird took 7 stage wins with 2 of the stages being cancelled. This took his total number of stage wins to 17 and also sealed victory for him and co-driver Andrew Roughead by 2 minutes and 16 seconds from Tony Bardy with Nigel Feeney 3rd over 3 minutes back. Now the team has a week to check over the Focus WRC and transfer it from tarmac specification to gravel as it is round 1 of the BTRDA championship, the Wyedean Forestry rally next weekend where last years championship runner up, Bird, will run as car number 1 as he looks to use his confidence from the victory this weekend to get a good start to the championship. The team will also be quick to assess what caused the fire on John Stones car and repair any damage caused by it as he takes the Skoda to Ireland in 2 weeks time for the first round of the Irish National Championship.